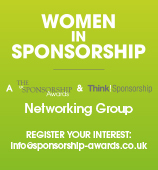 The UK Sponsorship Awards 2019 will take place on March 26th at the London Marriott Grosvenor Square. Tables of 12 and 10 are available as are individual places. To book places/tables please click on one of the buttons below. A drinks reception at 18.45 will be followed at 19.45 by a three course dinner with wine. The Awards ceremony will commence around 21.30. Carriages at 12.00. Invitations will be despatched on receipt of booking. Once your table has been booked, you will need to download and complete our Guest Details Form.